One of Tesla's parts suppliers reported a boost in orders from the company. Tesla seems to be boosting Model 3 production, according to a report in Electrek. Reports from Taiwan say Tesla is ordering enough parts from the auto component supplier Hota Industrial Mfg. Co. to now produce 5,000 units per week. This is a significant boost from when the company slashed its Model 3 parts orders by 40 percent in October – an output of only 3,000 vehicles per week. Tesla has been mired in production issues since they began producing their Model 3 electric vehicle in July 2017. CEO Elon Musk has even previously admitted that the remainder of the year would be “production hell” for the company. Musk originally set the production target for 20,000 cars per month by September 2017, but the company missed that goal by a wide margin – producing only 260 vehicles that month. This return to a 5,000 units a week production pace means Tesla could be back on track to meet Musk’s target starting in January. The Model 3 electric vehicle. Image Credit: Tesla. This year’s Model 3 release was met with appropriate fanfare, with automobile critics lauding the vehicle despite its slow-trickle production. 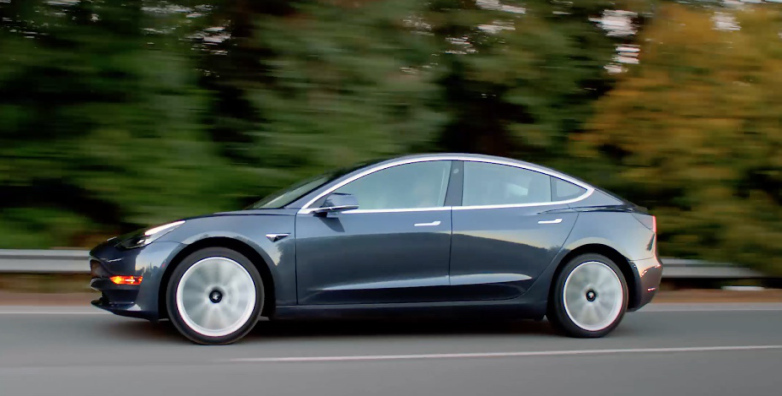 Jack Stewart at Wired wrote, “The arrival of Tesla’s Model 3 signals a new chapter in automotive history…” This fall, the first Model 3s were delivered to Tesla employees, who were given shipping priority. But many non-employees are still anxiously waiting for their orders to come through. Now, reporting from Telsarati claims that 100 to 200 Model 3s were spotted at a delivery center near the company’s Fremont, California factory where the Model 3s are being assembled. This could mean that Tesla is finally ready to start delivering the vehicles to members of the general public with vehicle reservations. The uptick in production could also signal that those deliveries will continue with increased regularity. The relatively affordable Model 3 – with a starting price of $35,000 – could certainly mark a shift for the future of personal transportation. The shift from gas-powered vehicles to electric ones continues to gain momentum, and Tesla’s products are leading the way. But the company just has to make sure it can deliver on those products at a faster pace.